Dave and Bobbie welcome you to the Royal Standard Gerrans website! Please take some time to browse the site and enjoy the pictures and history. The Royal Standard is a Free House! This means we will have much greater choice in beer and cider selection. We will be selling Sharps beer – look out for Sharps Own which is the original Sharps brew. Check the drinks page for a full list. As a rather old fashioned pub we do not have a T.V. or gaming machines. BUT….. we do have superfast broadband thanks to the Superfast Cornwall programme so come and use this free facility. Follow this link to buy ferry tickets or a Fal Mussel Visitor Card at a 5% discount! We can take bookings for Sunday Lunch – at all other times you can just turn up! 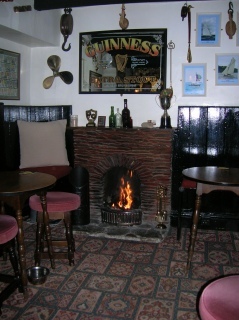 Our fires will be lit to keep the chill out over the winter. Dogs are always welcome (with well behaved owners!). We are now doing a traditional Sunday Roast. Local produce freshly cooked. All of our meat comes from AR Day our local butcher. Booking advised. Take a look at www.nisceriel.com to read about Ray Tyrrell’s new book The Kings Mistress – the first of the Niscerien Chronicles. Its a good read! If he is in he might just sign your copy! The follow up book The King Mother is now available – find out what happened next! 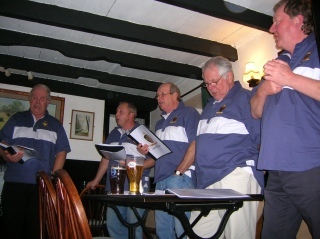 We are now selling the CD from our very own local shanty singers (pictured below) Du Hag Owr. Check out their web site at www.duhagowr.co.uk where you can buy their CDs and find out about their gigs. Check out The Mirror for a review of the area and us!